I meet with design thinkers, services designers and social innovators every week and we are starting to get them to help us prepare our library for its exciting future model. The model is fueled by the implementation of new technologies like ASRS and RFID, but we also realise that we need to change as an organisation and develop a new service model that fully realises the potential offered by these technologies. We are starting small and our first project to be facilitated by one of these designers (Grant Young from Zumio) will be an in house sustainability initiative. More on that when it gets going. 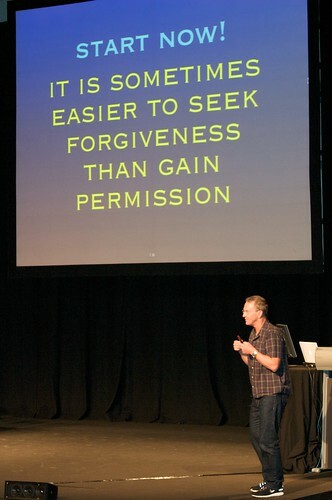 A culture that believes it is better to ask forgiveness afterward rather than permission before, that rewards people for success but gives them permission to fail, has removed one of the main obstacles to the formation of new ideas. At UTS I've been lucky enough to work for Dr Alex Byrne for over two years now. That is exactly how he operates and I've enjoyed that culture and tried hard to encourage my unit to work together in the same manner. If you work somewhere that doesn't even allow you to speak up before checking with your boss first or if that is how you manage your own organisation, then something is seriously wrong with that picture. Great post Mal! Inspiring and motivating as always! Having now started to read Tim Brown's Change by Design first chapter exam comes from Shimano and talks about biking. No wonder you were hooked Mal..and now so am I! Thanks again for your posting!